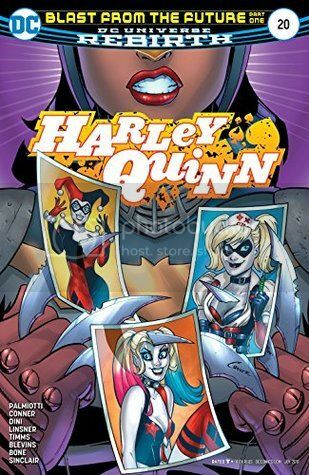 Book Summary: “VOTE HARLEY” part one! The corrupt mayor of New York City has been a thorn in Harley’s side since the day he stepped into office…and now he’s crossed the line one time too many! Harley’s usual methods of dealing with problems like this have failed her, so it’s time for a more unconventional solution…is New York City ready for Mayor Harley Quinn? It better be! Madison's group of thugs, the Unconquerable 25, have failed immensely after tangling with Harley, her crew, and the Gotham Sirens. Unfortunately for Madison, only the leader of this gang has survived the face-off and now is in the custody of the police. Of course, the corrupted mayor, whom seems to have to have Madison on his payroll, is not thrilled with this and let's her know that she needs to do something to ensure that the leader of the gang does not talk about his connection to them. He tells her that something needs to be done and she needs to take care of this quickly. Madison heads down to the NYPD and takes care of the matter by killing the leader. She does this in front of a cop but the cop apparently seems to be on the payroll of the mayor as well. How he is going to cover up the murder of the gang leader is going to be interesting but at the same time it seems Madison may have started the countdown to her ultimate demise. This killing seemed to be a bit sloppy seeing as she was possibly seen going in and inquiring about the leader of the gang. The only thing saving her life at the moment is a phone number to the supervillain named Scarecrow. As for Harley, she, Ivy, and her little gang have gone undercover to take out car thiefs. Things don't go always according to plan (anything with Harley never does) and she finds them in a bit of a situation. It is with the help of Ivy's plant skills and Red Tool that they are able to take down the thieves. It is afterwards that Harley announces her intention of throwing in the political towel for mayor. It was nice to see Ivy still sticking around and getting them out of the sticky situation. I hope we will be seeing a lot more of her and even more of the relationship between she and Harley. I am still enjoying this series. 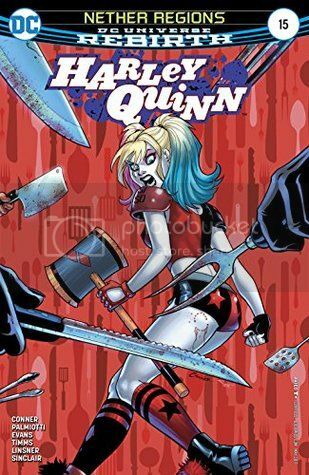 It has had it bumps every other issue but otherwise it is nice to see Harley continue to grow as a character and I am quite looking forward to seeing how she tackles her upcoming role in the political world. 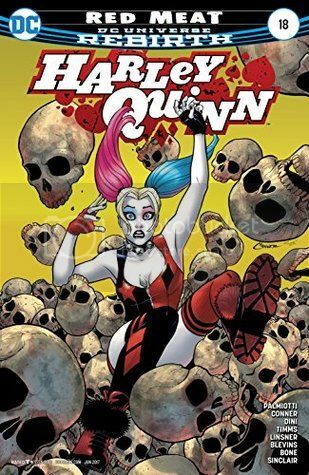 Book Summary: “MEAN STREETS!” Harley’s been doing her best to hold her corner of New York City together, but the mayor’s been doing his best to tip the whole town into corruption! Harley’s gonna have to hammer some sense into this guy once and for all…and in “Harley Loves Joker” part ten, The Joker’s vendetta against the thief who’s been scalping all his prime jobs threatens to get everyone killed! This comic book picks up where the last issue has left off. In her desperate bid to rid the world of Harley Quinn, Madison Berkowitz has hired more than two dozen dirty assassins to do her bidding. Unfortunately for these guys, they don't know Harley and for one thing, she is definitely not going to be forgiving for having her birthday ruined by anyone. These dirty assassins have come to realize that Harley is not anyone who is will roll over and play dead when she is surrounded and outnumbered. Nope, our gal turns the tables and takes them out in the goriest way only she could be known for. The rest seem to do the rolling over and playing dead. Although we don't see many of Harley's squad out in front, we do get a taste of the Gotham Sirens and what these gals are capable of when standing out on their own. These girls do live up to their bad girl image when taking down their enemies, especially Ivy herself. Ivy lets loose her most wicked plants and let's them do the most damage bringing down helicopters and killing off the assassins one-by-one. When the chaos finally clears, Harley is reunited with her Sirens. This comic wraps up nicely. Unfortunately we know that Madison will not be pleased with the failure of the assassins she sent after Harley so I am sure we will be seeing more of her in the coming future. We are also introduced to some new characters and I am quite certain there will be reason for their brief appearance here in later comics to come. Harley continues to bloom even under the heaviest stuff thrown her way and it shows that her character is growing in every way it can. I am enjoying these comics immensely and I have to love the storylines and the art that comes with every issue. I am looking forward to the next issue. 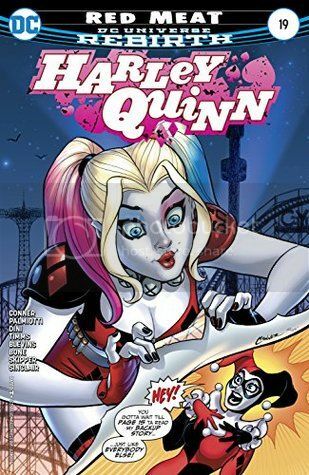 Book Summary: “BIRTHDAY!” It’s an oversize anniversary issue as Harley’s entire cast of crazy characters comes together to celebrate the birthday of cyborg senior citizen Sy Borgman…but is there actually a bigger secret behind this gathering? And in “Harley Loves Joker” part nine, Harley’s spent a fortune building out The Joker Gang’s new hideout, and now they’re gonna have to take drastic measures to pay the bill! Book Review: The story opens with some development in the Madison storyline. She is in the process of hiring the biggest guns she can find and tossing them in Harley's directon, hoping that they will have the ability to take her out. As the party gets into full swing so does Harley. She ends up jumping out the window and into the arms of Power Girl. But what is a party without bullets and beatdowns from Harley? It would not be a party, now would it? So Harley and her gang are off to war and things don't really seem to be going as well but I suppose we won't really know the results until the next issue. This was a rather fun issue. I loved seeing Harley allowing herself to be free for once and having no real cares in the world. I also enjoyed the fact that not only did the Gotham Sirens have a reunion so did Ivy and Harley. It was nice to see them together. I cannot wait to see what the next issue has in store for us. Book Summary: “Red Meat” part two! Harley’s managed to carve out a kind of peace with New York’s corrupt mayor…but once she gets wind of his plans for the city’s homeless population, the deal is most definitely off! And did I mention Power Girl shows up? This has a lot going on but where a new storyline is starting, the other two are nowhere near the end of the line. So you have multiple somethings going on but no ending in sight and I can see why a lot of people would become frustrated with this. I know several times I became confused by the going ons. This book, once held my interest, but now I feel that my attention toward is waning at best. I want to keep up with it but there are so much I can enjoy about it and then there are things I find that bore me to tears. I am going to stay as much as I can and hope that it goes in another direction that will once more renew my interest.